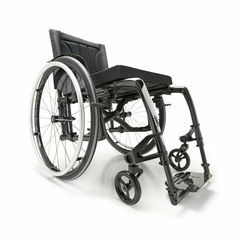 Carbon fibre genius in a functional folding wheelchair! The Veloce is the most technologically advanced wheelchair for active users with built in adjustability for the perfect fit without adding to the weight. 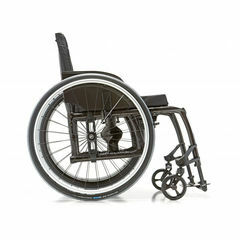 It redefines what a wheelchair should be by offering unrivalled lightness, rigidity and responsiveness while keeping a compact folding system. The Veloce features an incredible low total starting weight of 8kg and a transport weight of only 5.1kg. Like all Motion Composites chairs, the Veloce is highly adjustable and can achieve an incredibly low seat-to-floor height. It also uses the same high quality carbon fibre material used in aerospace to design, making it one of the lightest wheelchairs on earth.